tags: Heaven will raise hell on Earth. 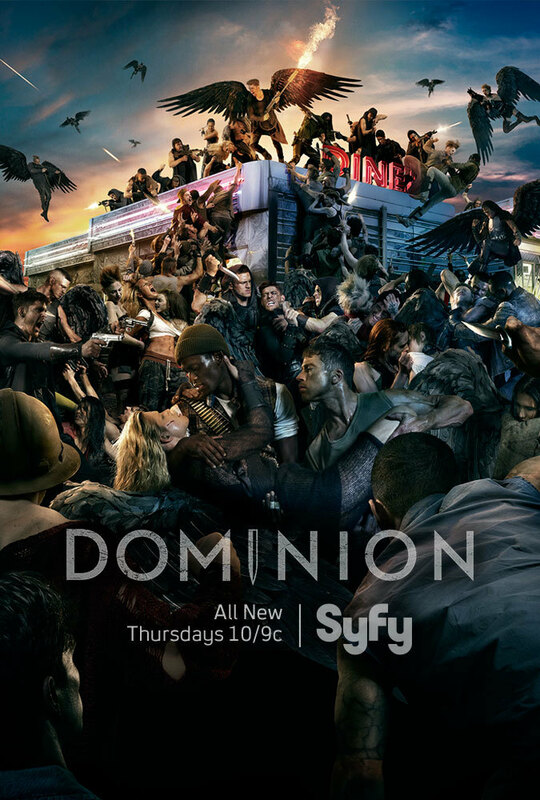 Dominion is an epic supernatural drama set in the near future. Specifically, 25 years after "The Extinction War," when an army of lower angels, assembled by the archangel Gabriel, waged war against mankind. The archangel Michael, turning against his own kind, chose to side with humanity. Rising out of the ashes of this long battle are newly fortified cities which protect human survivors. At the center of the series is the city of Vega, a glistening empire that has formed from the ruins of what was once Las Vegas. Follows the perilous journey of a rebellious young soldier who discovers he's the unlikely savior of humanity. So, knowing this was a spin off I went back and watched Legion before watching the pilot of this series. I then lowered my expectations (going from film to TV is always going to be a little disappointing) and sat down to watch. Oh my! There is a good idea in the basic premise of the show, but good lord did they do their best to kill it. So why, in such a short time span, did the humans feel it necessary to rename Las Vegas to just Vega? Do their scavenging parties get lost when they go outside the walls? I can imagine someone looking at a map (which they probably still use to navigate) and going "Hmmm. Can't find Vega on the map, just this Las Vegas place. How do we get home?" It's just ridiculous. The survivors seem, in this limited time frame, to have reverted to a form of upper and lower caste system mish-mashed together with a healthy dose of ancient Rome. It's a pitiful attempt at showing a dystopian society that just makes you shake your head all the time they spam it in your face. And just who was it that decided that all such societies have to have manipulating, power-hungry people in them that serve their own ends rather than the people they supposedly protect? It just shrieks of lazy writing. Save me from writers that think political intrigue is required in every show. Just cause Game of Thrones has it doesn't mean you need it in everything. So, the pilot plods along pedestrianly for the most part, introducing us to the cast and the setting but doing little to keep your interest. The characters are uniformly bland and uninteresting and it is difficult to like any of them, except maybe for the "Newt" analogue. Towards the end, our hero receives the gift of magic tattoos that will reveal to him how to save humanity from the evil angel scourge. Except, going on the strength of the first bit that he deciphers I suspect the tattoos are going to be a Macguffin designed to further the plot whenever needed by telling the hero where to go and what to do. Either that or he's just gotten himself a full body Magic Eight Ball to dispense pearls of needless wisdom such as the "Beware those closest to you" as happened at the end here. Sheesh! I had hopes for this show after re-watching Legion, but this is just dire. It's going to bog down in political machination and not go anywhere fast. It will be interminable. Expect nothing much to happen all season. If I were writing it there'd at least be a season's end payoff - maybe a Pompeii-like destruction of Vega and the survivors left having to fend for themselves in the "outdoors" in the last episode. Something worth watching all the dreary in-between episodes that we are sure to get. But I doubt that will happen. EDIT: So I forced myself to watch episodes two and three. Briefly, we are allowed to leave the drearily-envisioned Vega, but only so that the hero can be forced to return there. Oh God! It's so tedious and obvious! Three episodes, I'm afraid, is my limit, which makes it even less watchable than Helix, in my book. SUMMARY: Tries hard not to be a formula show, but fails very quickly. A nice idea, maybe, but hampered by dire-logue and stupidity, it is sure to have a short run. Dominion really is different. You might even call it flat out bizarre at certain points. As one who initially mistook it for another tacky zombie-ridden flesh crawler, it is now slightly difficult to explain why I still find the series "BRILLIANT" so long after cancellation. Stunning special effects and stunt work helped, to be sure. However, in time, I realized (at least for myself) that this alone wasn't what drew me in. Supernatural, controversial, graphic, dark... pick any aspect you wish. For me, this was all superseded by an incredible cast and all-too- human themes of love, hate, heartbreak, hope, and the battle for survival. If you started out, as I did, and found Dominion to be "bloody," "distasteful," or even irreverent, I will not disagree with that assessment. Very simply, I urge you to watch a few episodes again. Perhaps then, you'll understand how a former hater is now a loyal fan hoping that this unusual apocalyptic drama is soon revived. I would LOVE to see more of EVERY story line!